In the first week of the new year, the Trump administration showed no sign of easing up on its habit of alienating both allies and rivals, primarily through the president’s often bizarre Twitter pronouncements. Journalists and commentators alike once again raised the question of whether Trump is mentally fit to fulfill his duties as the leader of the United States. The Middle East and its neighbors have been frequent targets of his unconventional and spontaneous foreign policy. On Wednesday, the president threatened to cut financial aid to Palestinians, or to the UN agencies that provide educational, medical, security and housing support to them. It’s not entirely clear what his intention is but the tweet demands that Arabs commit to peace talks with Israel if they wish to continue receiving international funding. Since such financial support ensures a minimum of stability in a tumultuous environment, Israel and other neighbors expressed deep concern over this possible measure. Trump went a step further on Thursday when the administration announced it was suspending security assistance to Pakistan, including $255 million in military aid this year, as part of a new strategy for ending the war in Afghanistan and defeating terror groups in the region. Trump’s tweet remarked that Pakistan’s government has played the United States for “fools” and received nothing but “lies & deceit” in return for $33 billion in aid over the last 15 years. Pakistan is accused of providing a safe haven to violent groups including the Taliban and al-Haqqani that continue to terrorize Afghanis which Pakistani leadership denies despite strong evidence to the contrary. Fallout continues from Trump’s recognition of Jerusalem as the capital of Israel. On Tuesday, Israel’s parliament passed an amendment that would make it harder for it to cede control over parts of Jerusalem in any peace deal with the Palestinians, who condemned the move as undermining any chance to revive talks on statehood. Meanwhile the Arab League held a special meeting in Amman on Sunday at which several members called for international recognition of a Palestinian state with East Jerusalem as its capital, aiming to nullify a controversial US decision on the holy city’s status. That same day, Israel announced it will restore electricity to the Gaza Strip after cutting it off in July following a request by the Palestinian government in the West Bank. The Palestinian Authority made the request in an attempt to pressure Hamas to cede control of the territory. Many in the isolated enclave had been living on as few as 4 hours of electricity for several months. Israel also ramped up its offensive against groups involved in the Boycott, Divestment, Sanctions(BDS) movement which aims to put pressure on Israel to end its occupation of Palestine through economic means. On Sunday, Israel identified 20 activist groups from around the world whose members will be banned from entering the country over their calls to boycott the Jewish state. The BDS movement was also in the headlines recently after singer Lorde cancelled a summer concert in Tel Aviv following pressure by activists. Farther afield, thousands of prostesters in Iran continued to march in streets across the country against ongoing inflation, corruption and the president’s economic policies. The protests against the president quickly turned into rallies against the country’s clerical leaders. Slogans of “Death to Rouhani” gave way to “Death to Khamenei”, Iran’s supreme leader. 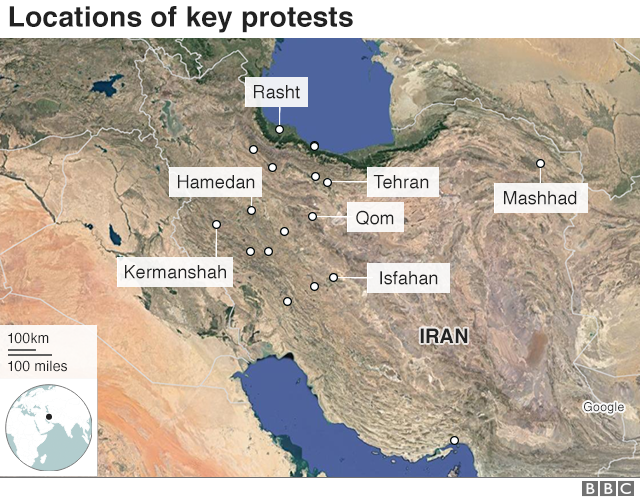 Anti-establishments protests in Iran began in the city of Mashhad. 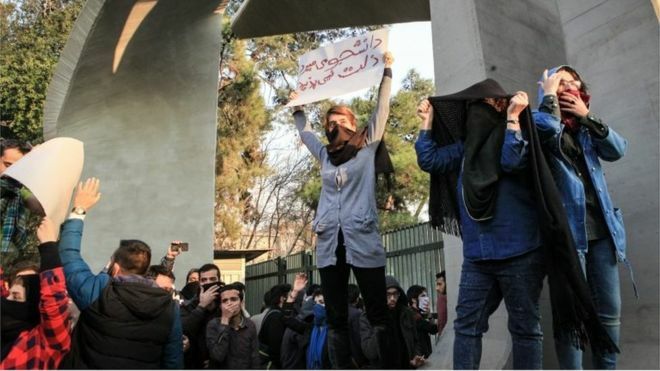 Within a day, the unrest had spread to some 25 towns and cities, and slogans went beyond the economic, including calls, for instance, for an end to Iran’s involvement in Lebanon and Syria. Several protestors have died and authorities have cut off access to social media platforms. Khamanei blamed foreign enemies but the movement appeared to be home-grown. On Sunday, Iran banned the teaching of English in primary schools, a senior education official said, after Islamic leaders warned that early learning of the language opened the way to a Western “cultural invasion.” Attempts to curb the influence of foreign enemies may have played a role in the announcement though no formal link with the protests was mentioned. Iran’s steadfast rival, Saudi Arabia, carried on with its shake up of the status quo. On Saturday, eleven princes were arrested after protesting the government’s new decree that everyone, even royals, is responsible for the payment of their own electricity and water bills. The king and his son, the crown prince, have declared a commitment to ending corruption among and subsidies to the country’s royal family and elites.